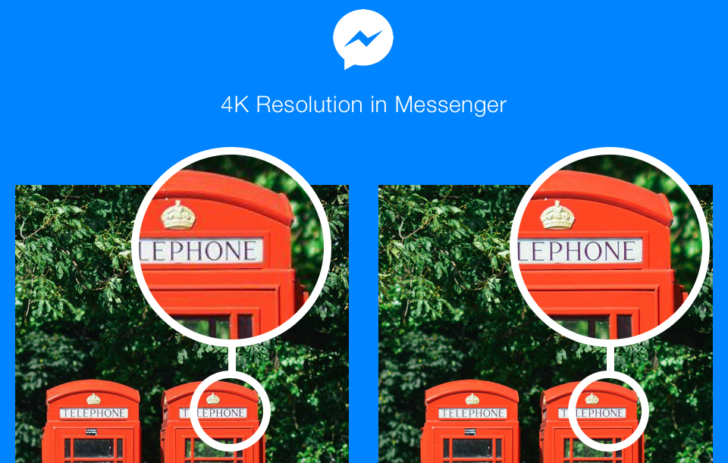 Until now, the default resolution for images sent and received on Facebook Messenger was 2K. That's quite small in terms of megapixels, and anything higher you tried to send someone would be compressed by Messenger before sending. Facebook has just bumped the default image size up to 4K (up to just over 16MP) so you can now send photos of much higher quality to friends and family. If you wanted to send an image at a decent resolution before now, you would have had to use a photo link or send in an email, as most messaging services heavily compress your images. 4K offered by Messenger is up to 4,096 x 4,096 pixels per image, which is the maximum quality most of our smartphones natively shoot in nowadays. According to Facebook, 17 billion photos are sent through Messenger every month, so this is no small change. There should be no extra time added to the process of sharing photos, despite the increase in size. 4K is rolling out to Messenger users on iOS and Android in select countries today, including the US, Canada, France, Australia, the UK, Singapore, Hong Kong, Japan, and South Korea. More countries will be added in the coming weeks.